This article revisits one of the key factors in the sluggish housing start recovery since 2007 — the lack of household formations by younger adults. As will be clear below, we believe the key driver for housing starts will approach and exceed the long-term trend of 1.2 million households per year in the next few years. This is the primary reason we remain confident in housing starts moving up to 1.8 million units per year within the next three to five years. Over the last few years, we have highlighted the fundamental problem of forecasting housing starts in this cycle compared to earlier ones. Not to say that it was a perfect science, but we used to forecast housing starts as a lag to interest rate movements. After interest rates went up (1978-79), housing starts fell (1980-81). After the Federal Reserve cut interest rates (1982), housing starts rebounded very quickly (1983-84). As seen in the graph below, a similar story happened in 1973-76 and in 1988-91. Some analysts came to believe that housing cycles happened every three to five years and would plug that cycle into their forecasts. But as you can see in the graph, that is not true. In the 1980’s, the housing cycle was closer to eight years. 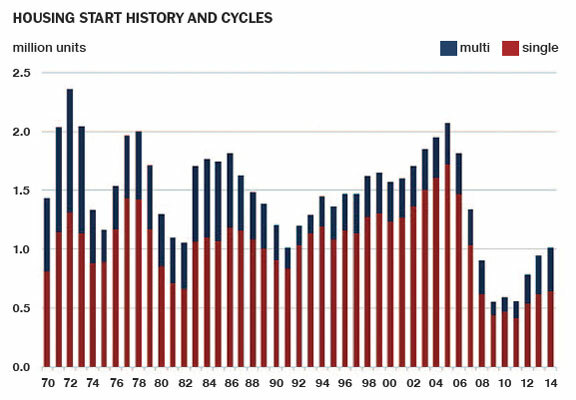 After 1990, housing starts were rising or stable for 15 years. By 2005, many people in the housing and wood products industries believed the housing cycle was dead. The insanity, with regard to both policy actions and lending standards, that fueled the bubble in 2002-06 set the stage for the debacle that followed. Housing starts fell into a depression and contributed to the severity of the Great Recession. Despite aggressive Federal Reserve actions in cutting interest rates and buying mortgage-backed securities, housing starts have been very slow to recover.